Because the Xeikon CX3 is designed to efficiently produce short runs with tight delivery times while meeting complex design and layout demands, it perfectly complements the existing printing equipment at Anjou Etiquettes, including offset and letterpress presses. “By having an alternative to offset and letterpress, we will be able to respond quickly and at very competitive prices to requests for short label printing runs and multiple versions. These are key markets which we were no longer servicing due to constraints in our production platform, and now they will be important elements of our offering,” explains Maurice Darré, Chairman of Anjou Etiquettes. Since it was founded in 1978, Anjou Etiquettes has built up unique expertise in the label manufacturing supply chain; from graphic design to printing, and from processing to logistics. The company produces labels on rolls, sheets or non-stick labels for a wide variety of industries, ranging from agribusiness to phytosanitary, cosmetics, wine, and more. The vertical integration of all production functions allows it to control production quality and timelines at every stage of the process. When the business decided to invest in digital printing, its primary concern was print quality. “We asked four suppliers to print out some files we provided so we could compare their print quality. 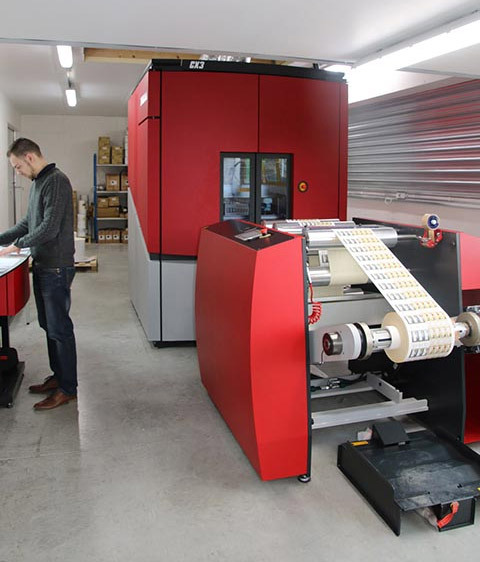 The Xeikon CX3 digital label press performed best, as its printing registration is unequalled. It was also the best choice from a financial perspective,” Darré says. Located in the heart of the Loire Valley, the reputation of Anjou Etiquettes largely rests on its ability to manufacture high quality labels for the wine industry. The Xeikon CX3 dry toner technology is ideally suited for meeting the demands of customers who use structured paper labels printed with hot- or cold-stamped gold foil and raised text. Against the background of a growing national label market, which is driven by an increase in the number and types of products along with more stringent regulatory requirements, Anjou Etiquettes is aiming to increase its turnover through this investment, in particular by attracting new customers it was unable to serve before.